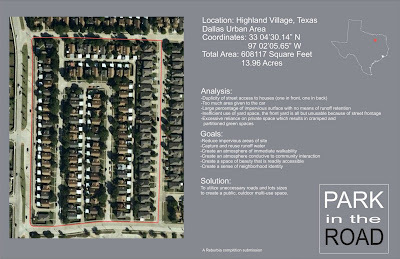 “In an effort to improve the aesthetic, health, sustainability, and identity of a suburban neighborhood this proposal creates public parkland flowing through existing developments by eliminating excess streets and reallocating lot portions. 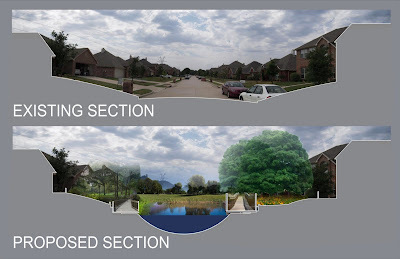 The resulting design significantly reduces storm water runoff and significantly increases the usability, safety, and beauty of the neighborhood. 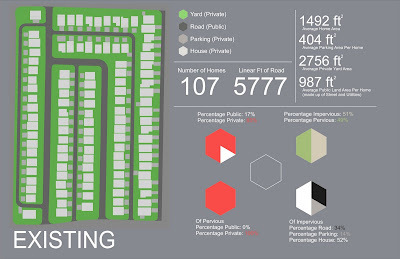 It sacrifices private front yards for a public space in which the entire community can interact, play, and relax. It reduces the area in the community in which cars are allowed. This increases the safety and usability by smaller children and provides an opportunity for walk-ability from their adult counterparts. It creates areas of wildlife refuge which provides opportunities for wildlife viewing and a greater interaction between the community and the natural world. I love the public front yard idea. Some of the wealthier neighborhoods in Trujillo have this, except they're on a town-square model rather than having roads turned into park space. 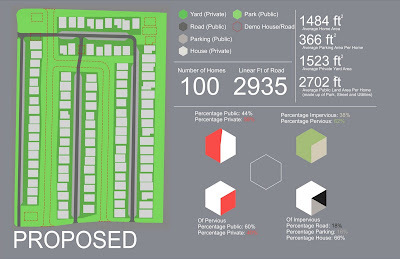 So, there's a big rectangular park in the middle with houses surrounding it. The houses in the development where your Grandpa Don lives on the gulf coast of Florida look similar. They have tons of ponds because the the nature of the landscape. 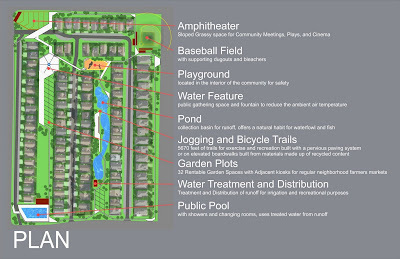 All of the neighbors' backyards lead up to a pond or golf course with no fencing between them. I think you have some landscape architect in your blood! Yeah, I thought of you Will when I was doing this competition. Should have outsourced it to you, you probably have much better tree graphics than I.